The United States is home to various species of ground, tree and flying squirrels, such as the gray squirrel and California ground squirrel. Tree and flying squirrel species reside in trees and forests, while ground squirrels live in underground burrows. Unfortunately, these rodents are susceptible to some common diseases, many of which can spread to humans. The bubonic plague, caused by the bacterium Yersinia pestis, is common in ground squirrels, particularly in the Southwest. Squirrels, as well as other rodents, are common reservoirs for the bacteria. While some squirrels may show no symptoms at all, others may experience weakness, fever, gangrene and a petechial rash due to hemorrhaging underneath the skin. Plague spreads to humans through bites from the squirrel or from fleas that have fed on the squirrel. When squirrels infected with plague are discovered in parks or campgrounds, officials close the parks and treat the area for fleas. 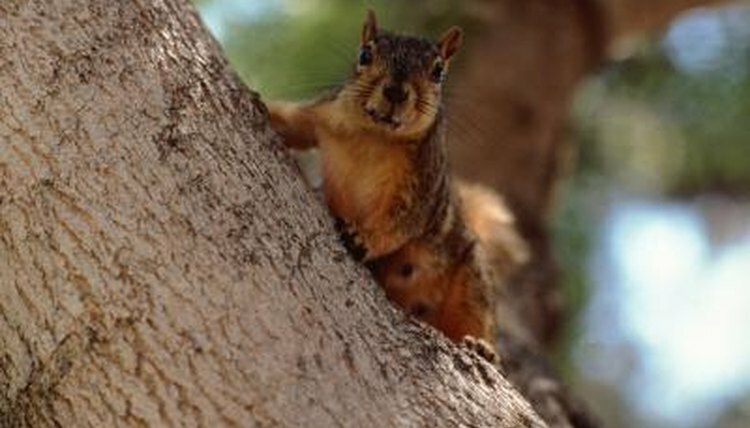 Antibiotics help humans who contract the disease from squirrels. A common viral disease infecting squirrels is squirrel pox, or squirrel fibroma. The spread of the virus occurs through insect bites, such as from mosquitoes. The virus causes skin tumors to appear on the body. Typically, these tumors cause no other problems for the squirrel unless secondary skin infections develop. Occasionally, the tumors may spread to the lungs, liver, kidney or lymph nodes. If the squirrels in your back yard appear to be balding, notoedric mange may be responsible. Microscopic Notoedres douglasi mites burrow into the squirrel’s skin, leading to hair loss and thickened, dark skin. Typically, notoedric mange does not cause any additional symptoms and full recovery often occurs. Another cause for squirrel balding is fungal infections, or dermatophytoses. Fungal infections leave hair brittle, causing it to break off and leave short stubble, making the squirrel appear bald. In addition to the possibility of spreading plague to humans, squirrels can spread a variety of additional diseases. Tularemia, caused by the bacterium Francisella tularensis, spreads through bites from infected animals, skin contact with sick or dead squirrels, ingestion of contaminated water or tick and deer fly bites from insects feeding on infected squirrels. Leptospirosis is another common disease spread by squirrels. Leptospirosis can lead to kidney and liver failure though infected squirrels may show no symptoms. To avoid contracting a disease from squirrels, do not attempt to feed or handle squirrels, especially if they appear ill. Use insect repellant sprays in areas where flea or tick bites may occur. The Verge: A Squirrel in California Has the Plague. Should You Be Worried? Purdue University Everything Wildlife: Hairless Squirrels?